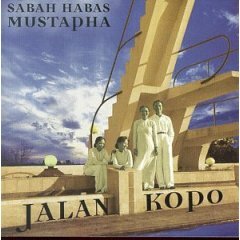 After turning in my review of Sabah Habbas Mustapha's latest CD So-La-Li to The Beat - which includes a short e-mail interview with The Artist Formerly Known As the Prince of Mustapha Bassists - my editor CC Smith senselessly harrangued me into including an old Hijaz Mustapha interview on my website. The interview was conducted by telephone in the Spring of 1990 while the 3 Mustaphas 3 were finishing studio work in London on what would turn out to be their final CD of new material, Soup of the Century. Here is the text of that review along with a Discography of the Mustaphas that's more or less current and correct as of this writing. Also included and seeing daylight for the first-time ever is a sidebar I originally submitted with the Mustapha interview called Gossip of Mustapha: The Ten Most Scurrilous Rumors which my editor suggested was decidedly unfunny. It is exactly as humorous today as then, thanks to the foresight of myself and co-sidebar writer, The Whale, who went on to achieve infamy of his own in the pages of The Beat. The most stubbornly maintained showbiz mystery since J.D. Salinger's mailing address is the 3 Mustaphas 3, transglobal multilingual polyethnic wündergruppe of a numbing onslaught of nerve-end damaging eastern-tinctured musics from taarab to Transylvanian-plus the odd merengue and benga blast casually tossed in as smoke bombs. When clears the smoke, arises the question: from whence came these annoying Mustaphas, five men and purportedly a woman with identical last names? Szegerely, as they claim, in the Balkans? Tel Aviv? Tirana? Basingstoke? And who is this slippery Hijaz Mustapha, violinist, bazouki player and occasional sucker MC? Peugeot mechanic? British record company exec? Azerbaijani czarist loyalist? In Flying Saucers: A Modern Myth of Things Seen in the Skies, C.G. Jung observed that it mattered little whether UFOs were real. Their persistence as social-shaping folk-belief was the fact that counted. Were the professor alive today, he'd undoubtedly light his pipe and pronounce the same opinion regarding the 3M3. Whether Armenian, American or Albanian is irrelevant. The sufi poet Rumi wrote, "Out beyond ideas of wrongdoing and rightdoing there is a field. I'll meet you there." Within the Mustapha myth, beyond dualistic concepts of truth and falsehood, lies the essential heart of uncle, the meaning of the band that is the Mustaphas' strength as well as its Achilles tendon. This topic was the spark which split the five-o'clock-shadowy Hijaz from mixing the new 3M3 cd to hector me via phone from Britain. I let slip that when I approached The Beat's Minister of Information C.C. Smith about doing a feature on the Mustaphas, she snorted, "They're a joke band, aren't they?" But Beat associate Editor Tom Cheyney cried, "Absolutely! Yes! Do it!" "So Cheyney said it's deep because it has the different resonances of the myth," Hijaz mulled sleepily, drained from a long, acidophilus-depleting studio session. "There's more in it than meets the page, is that what he says?" Bam! I had hit a nerve, as evidenced by the undulations from early to late Mustapha releases. Where antediluvian products like "BAM! Mustaphas Play Stereo" wore the ambience of a drunken bash, the current cd, Heart of Uncle, is restrained, well-crafted and polished, eccentricities emerging primarily in the details. Hijaz's response confirmed what I had guessed-that although the band's fez-topped Pee Wee Hermanesque image has allowed the 3M3 to slyly introduce 'difficult' material to unsuspecting audiences, just as jesters are allowed to joke great truths, the accompanying feeling that somehow the Mustaphas are not 'real' musicians has hurt. "It's very interesting," he snarled, "because The Beat was once The Reggae and African Beat and now it's just The Beat. Because for Mustapha, we have worked in many excursions with African artists." Citing the Mustapha rhythm section's stint as The Jali Roll Orchestra on Jali Roll, a collaboration with Senegambian kora musicians Dembo Konte and Kausa Kuyateh, Hijaz claimed, "In Gambia I went to visit with Dembo Konte, and I sat in his compound and had the pleasure of hearing these records on Gambian radio that we made. In that context, the musicians themselves and the people in the country didn't say, 'Oh, it's not a real thing because Mustapha is playing, so it must be a joke.' They just went, 'That's very good.'" "We really enjoyed playing with them," Dembo Konte says of the Mustaphas in the Hijaz-produced Jali Roll's liner notes, adding in suspiciously Mustapha-sounding syntax, "They get the rhythm very correctly, like Africans who are used to playing with the kora." An earlier collaboration with Zimbabwean mbira artist Stella Chiweshe resulted in the Ambuya? lp. "This inspired her to find her own bass player and drummer from Zimbabwe, which she now has, so we were taking her out of the acoustic tradition and making something new," Hijaz barked, the flap of his arms audible despite our bad connection. If Hijaz wouldn't readily admit to a chink in the Balkan body armor, I could hardly blame him, judging from the response at the free Mustapha concert at Chicago's Navy Pier Ballroom, May 27. Unmoved by Irish rocker homeboys, The Drovers, and r&b big-butts, Big Shoulders, the crowd clog-danced up a clatter at the first blast of jolly goatherd music. But that other audience, the great gray undifferentiated mass which has prematurely turned its back on the Balkan Beat Boys, has fallen prey to the simplemindedness of TV culture, the phone-Mustapha mused. "I think nowadays you expect from life what you get from the screen, which is to say you have something that is described in the program as a half-hour humor, then when it stops you have half an hour news," he ranted. "Everything is divided up like it is in the program, and for some reason maybe you think other parts of life that are not television shall follow those rules. But you know, we find it isn't like this at all, that we are very funny people who are serious at the same moment. And we like to make a joke, but we have passions and we understand the heart. And we have upsets and we are very happy and we are very sad, and it happens all at the same time. Because in life things all move in parallel. One doesn't start then another stops, you know?" I know. But in fairness, do switch the telly back on. Twin Peaks announced the coincidence of tragedy and absurdity with enough vigor to limp into renewal. Mary Hartman, Mary Hartman, dripping pathos and bile, arrived a decade earlier. And as my friend the Whale, an ex-professional wrestler on the Thunder Bay-Wawa-International Falls circuit, pointed out, his sport depends on the equal intermingling of disbelief and its suspension. Few of the spectators who whip themselves into a frenzy bidding former John Carpenter-leading man "Rowdy" Roddy Piper kill the Hulkster believe wrestling is real except insofar as they choose to have fun believing they believe. The day of the concert, the Whale and I took the slow shuttle bus the length of the Navy Pier, traveling at slightly less than foot-speed as our driver clung to the heels of sun-shocked shoppers prowling a thousand-block-long flea market. Perfect for the Mustphas, I told the Whale-a real third world marketplace ambience. Much of the audience that day had simply wandered in to partake of an afternoon's free show. Like my blubber-hided buddy, they undoubtedly had no previous exposure to Mustapha-scale complexity. Yet there sat the Whale, typical tv zombie, responding enthusiastically to the convoluted melange of rhythms and burlesque, chuckling as Sabah Habas, the "man of sentiment," juggled his scarf mid-song, shifting his bulk in approval when Hijaz's magical electric bouzouki ripped through an amazing rendition of "Benga Taxi." Nobody looked confused. What tragic chain of circumstances, you must be wondering, forced an athletic champion of the Whale's stature to turn his dorsal fin on the Northern Great Lakes Canadian Heavyweight Champion belt-buckle? The same frustration over image that torments Hijaz. "I don't see what he's complaining about," the Whale fumed, moody and 70 lbs. heavier from a week without cigarettes. "He's lucky to be able to make a living at all. No one appreciated me as an artist. I was just another ton of raging meat, but I never blamed the audience for my troubles. You're setting yourself up for a pin-fall when you try to simultaneously play the clown and the agile big man." "I suppose you can sum it up that we do a hard thing in a hard way," confessed non-Whale Hijaz. "It's a difficult task to play what we do in a difficult situation where people don't know what we're doing. Because we are Mustaphas, I suppose we don't care. We have to see it through." "When we started," he rattled on, "We were considered kind of punk. Balkan beat bastards. Everything beginning with 'B.' We were all these things in a row. Now I'm reading the newspapers and we haven't changed, we are just the same boys and girl with the same attitude, but now they say, 'Ah, welcome back to the shores for the godfathers of world music.' And we have become like sweet potato pie. We are 'nice good old fashioned, god bless you, they've done so much.' Really, we haven't changed. We are still as mean and bad tempered unpleasant people as we ever were. We are still not such a compromising group." "I think really if we changed our name and started again with the same repertoire, we'd be much more successful straight away. Because the climate is better in Europe now for this kind of music. So there are many strange facets to this, to go from being some kind of lone wolf group to being the dog on the hearth." This was close to a concession that the path might have been easier had the band ruled neat lines around themselves-in the words of The Year of Living Dangerously's Billy Kwan-instead of organizing around the idea of being Mustaphas. But Hijaz needn't worry. 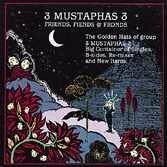 The 3 Mustaphas 3's musicianship is inarguably extraordinary, the repertoire rich, the delivery entertaining, thus folks cannot help but be flattened by the trunk of their great overgrown world-music oak, even if they miss the subtle shoots and leaves of the Mustapha mythos. "The Mustapha myth," he considered truculently, as if to himself. "I sometimes think we are a small factory for making myths. I sometimes think that we make myths that make their own myths. It is one of those strange things. I often read in the newspaper and it says things about us that didn't happen. I suppose they could have happened and that's just as good. Or they haven't happened yet... [such as, you know,] the story about Sabah Habas my brother, because at one point he was a fashion model before he was singing. We took him to sing and play bass. They said that he was running with Jerry Hall. I read this in a gossip column. I said to him, 'What is this?' He said, 'I don't know what it is.' "
"There was a thing about us writing a national anthem for Belgium, a new one. Many things. And they don't come from us. We have gotten to the point where so many people were saying, 'You are the Albanians. 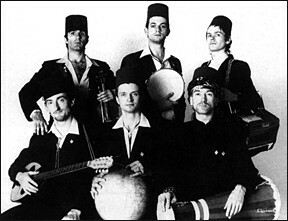 Ah, the Albanian rock stars in exile.' We have many many friends in Albania, we understand the music, but we will never say that. We put it in our contract: 'No mention of Albania or the show is cancelled, one-hundred percent fee.' It is getting too difficult with the problem in the area, so we said, 'No, no, no, no, no. No, no, no, no.'" The Mustaphas said yes, yes, yes, yes, yes to Rykodisc, however. The New Jersey-based independent label released Heart of Uncle in the states last spring and has an option on the as-yet-unnamed follow-up. An incredibly energetic if-this-is-track-six-it-must-be-Macedonia amalgam, Uncle stamps the wack 3M3 seal on Indian film music, merengue, taarab, klezmer, benga, Bulgarian... I need a nap just considering its scope. Fun, conviction, and consistency knot together the wild nest of loose ends. Yet for some, the cd's feeling that the Mustaphas have arrived tolls the departure of a beloved ship of fools. Uncle's well-tempered ambience is several ports removed from the warped pilings of their EP "Si Vous Passez Par La 3 Mustaphas 3"-with its on-the-job-training juju slide-guitar and taxi-hailing mini-drama. Its virtuosity-as-virtue value system separates it from the deadpan calm of the pre-Uncle breakthrough 45 "Linda Linda" and its manic Szegerely dub version. "I hope this new record is a little more sportive," allowed Hijaz. "We thought maybe we'd try to make more of a live feel in the studio, like an evening spent dancing with Mustapha. It's not so much of a contemplation recording. It's more development-of-the-body music." Tell me about one of the songs. "One of the songs is partly in American, partly Japanese, like honky-tonky music in Japanese with a Yugoslavian break in the middle [by GlobeStyle recording artists Jova Stojiljkovic "Besir" and his Brass Orkestar]-so we are being very harmonious." Is there a drum solo on the new cd? "There is also a drum solo." Any snow ballads included on the forthcoming cd? "A time of snow, that kind of ballad. If you look through the window you can see the young Mustapha's face pressed against the glass looking in from the snow." My favorite track on Uncle was the first cut, "Awara Hoon," taken from an Indian film. Have GlobeStyle records or the Mustaphas formulated plans with EMI-India for Indian film soundtrack albums? "The GlobeStyle company has made a deal with EMI for India to present three albums of film soundtracks. Because of this contact, we talked about going to Bombay to record an album with a film orchestra, so that is the idea. Like all ideas, if you tell anybody, it will go cold, but what the heck. We have many plans to record with different people. We should do more not to just record the music, but to record in different places and to involve other musicins who may not be able to have access to a studio. We do try. We do try." Tears began forming in my eyes. I thought I heard Hijaz so many miles away swallow heavily. Was it the unexpected confluence of emotion, I wondered, or a stubborn spoonful of yoghurt? "You want to ask questions," he concluded soberly. "But in a way you have almost I think asked some of the most serious questions. Not just of me but of human conditions. Because you are asking about myth, and development of myth and what is real and what is created for your own entertainment and different things and it is very complicated what you're asking. This is what is separating poetry from wiring diagrams, instructions for making your telephone. One is clear, one is just a fact. One is statement, and the other is giving us images, ideas you have to work yourself for your own mind. And one poem is meaning five things to five people and five Mustaphas mean a lot to many different people, but maybe not the same thing. "You are asking mysterious things of ambiguous life, it is very important. You are a poet in these questions, not a fact man, you are a poet. It is very late, I have been working very hard today, and I like the idea of sitting by the fireside with you and looking into the flames. But sometimes the flames are in the heart, and it is a different thing." As Hijaz spoke, his voice began to fade. I stared out the window at the snowdrifts that had gathered around my barn, around my bunny-hutch. A great orange salt truck lumbered by, promising hope of an eventual thaw to touch tires, spirits, all the earth. Mustapha spoke on, but behind his weary words lurked the desolate face of another, a broken man too tough to speak of giving up no matter how big and belt-buckled the competition had become. In the howl of the wind, in the mewl of Mustapha words, I felt the invisible flipper of a friend. "Everybody's humor is based on different meanings of the same word and poetry," Hijaz and the Whale were telling me at once. "I don't like it when we're serious. But I don't like it when we are just a joke." 1. Sabah Habas is running with Jerry Hall. 2. The Mustaphas are writing a new national anthem for Belgium. 3. Houzam dubbed in the voice of Don Meredith for several Lipton Tea commercials. 4. Niaveti and Kemo moonlight between cafe appearances as Florida pleasure-boat operators. 5. The Zapruder Kennedy assassination film was altered to protect the identity of Uncle Patrel Mustapha Bin Mustapha, seen in a third floor window of the Texas Book Depository unsuccessfully flirting with a librarian. 6. Under hypnosis, lovely lead singer Lavra revealed that during a three-day memory lapse she had been abducted by visitors from space and forced to perform plastic surgery on Cher. 7. The Mustaphas' pre-show cassette tape and t-shirt booth at the Navy Pier flea market in Chicago was shut down by customs officials for illegal whelk importation. 8. Sabah Habas plays Balki on "Perfect Strangers." Kemo is his stunt double. 9. Hijaz was a model for El Greco. 10. The failure of the 3M3 Savings and Loan of Angola, IN cost each American taxpayer $8.43 for its ill-advised investment in an inland whelk processing plant.